The original Star Trek and its reboot delighted in the contrast between the stoic, logical Spock and passionate, instinct-driven Kirk or McCoy. Not long before that, over fifty years ago, C.P. Snow gave his famous lecture on “The Two Cultures” and the divisions between Science and the Arts, providing voice to sentiments that existed long before then. So, the topics of Olson’s book aren’t exactly new. But they are still necessary. Graduate schools continue training scientists to ideally immerse themselves completely into a scientific framework, devoting themselves to their research in the lab and thoughts about their research out of their lab. Little to no emphasis is put on education or communication. Sure, one learns communication of results to fellow scientists, but not to the general public, a completely different beast. Olson’s book seeks to point out this issue and encourage scientists to pay greater attention to communicating to the world at large. In a series of four parts he waxes on how scientists should not act (too cerebral, too literal-minded, bad storytellers, and too unlikeable), and then closes with a fifth chapter encouraging scientists to take an active role in culture, not unlike Carl Sagan or Neil deGrasse Tyson. The short book is a quick read, and probably could even stand to be shorter for the amount of ideas it conveys. Olson writes very informally, injecting humor throughout. At times that humor works, but at many points it seemed awkwardly forced or inappropriately off-color. Olson’s major points are that the world is increasingly style-ridden. People aren’t convinced by facts, but by the show. Style has become the new substance. While trying to reverse this and encourage rational, logical thought is important, people are never all going to become ideal scientists, we aren’t Vulcan. Nor should we be. The skills needed for ideal science are not the skills needed for human relationships or communication with the general public. Olson does a very good job convincing the reader of this, but doesn’t offer much in the way forward other than a general directive that scientists need to realize this and adapt or implement public-engaging considerations, as they are most naturally fit. I find it interesting that what Science communication comes down to is Evangelism, the similarities to religious communication are numerous. Both cases are attempts to translate an understanding of truth to the general public, a public that may be unfamiliar with these understood truths and ignorant about how these are arrived at. Some may argue that science is ‘rational’ and thus ‘truth’, while religion is the reverse, but that is unimportant here. In both case those wanting to convey the information believe they have some sort of truth and want to spread that truth to an audience that at some level may be hostile and skeptical. When scientists act too cerebral, literal-minded, superior, and spout off facts with no story, this is basically the exact same thing as a piss-poor Evangelist who acts too emotional and illogically, reading their Bible as literally and senselessly as possible, an air of moral superiority, and spouting off Bible verses and condemnations. In that sense, Olson’s arguments in a larger context are more universally applicable on how humans should act to try and communicate anything they have strong opinions about to the general public. 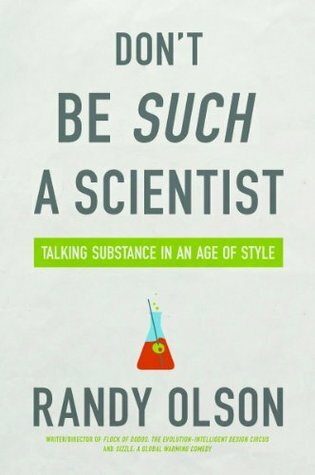 Olson bases his recommendations for the infusion of style into the substance of science with stories from his experiences in Hollywood. At times these asides or examples are useful and appropriate, but often they also appear to primarily (or at least equally) be present to promote his own productions and career. Doubtless, these are examples he is most familiar with, and given his scientist/Hollywood background his examples also involve science. Still, it felt self-serving at points and extraneous. I think more and more younger scientists are aware of the problems in the system of training scientists to be better communicators. But with employment and advancement having NO ties to these factors at all, it is hard to change. One most go above and beyond normal efforts, with no compensation in sight, to teach oneself to be a better communicator of science. And, as Olson points out, risk disdain or jealousy for having done so. Without a change in professional recognition and the demise of scientists who seem to think we should all be like Vulcans devoted in our entire being to science, I can’t see what will change. Olson doesn’t touch on this professional issue much at all other than acknowledging it vaguely exists. Thus, this book may be a good reminder to scientists who already realize the problem, or may further open one’s eyes to the issue, but I’m not sure what audience will be reached beyond that or what change it can affect beyond a preaching to the choir.